Unlikely friendships are a well-mined trope in feature film. 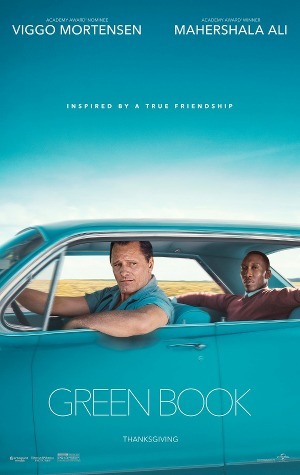 Just such a relationship is at the heart of Green Book starring Viggo Mortensen as an Italian thug and driver hired by a talented African-American pianist (Mahershala Ali) for a musical tour through the South. Getting its name from the book of hotels who will rent rooms to Blacks, Green Book offers the expected lessons in culture clash and gradual respect between its lead characters who learn from each other during their time on the road. Although based on real events, the story follows the expected Hollywood script as Tony (Mortensen) and Dr. Shirley (Ali) bond on the road over their, mostly cute and/or innocuous, arguments and disagreements. Despite dealing racism, both blatant and subtle, Green Book never dives too deeply into the subject as to upset its crowd-pleasing dynamic. The result is a safe and predictable film that still delivers a solid story blustered by its two lead performances as Mortensen and Ali play well off one another. The film includes a large cast of those met on the road, but Linda Cardellini (as Tony's wife back home) proves to be the only stand-out, and even her inclusion feels plot-driven as a necessary witness to the effect Dr. Shirley has on her husband. Even if it's a little too paint-by-number in terms of its structure and execution, Green Book offers solid holiday fare. Along with a moral for the audience, the film even offers characters fighting to make it home through a Christmas Eve snowstorm and obligatory Christmas dinner. Given what is provided on the the page, the film could have been borderline insufferable, but director Peter Farrelly gets in enough laughs and examples of real emotion and friendship to prevent the film from feeling too on-point or preachy. Green Book is far from a must-see, but Farrelly and his stars deliver a straightforward tale tailor-made for this time of year.